A baby girl was left with severe brain damage after the medical team failed to call resuscitation experts when she was not breathing at birth. Baby Nala was so severely deprived of oxygen that her brain damage left her unable to walk or talk, and she must be fed through a tube. At 3 years of age, a jury awarded Nala and her family $8.5 million dollars for her lifelong care. The eight-member jury heard almost three weeks of testimony by experts from around the country. Nala was a full-term baby who was in distress the instant she was born. She had a heartbeat, but failed to start breathing. The obstetrics nurse attempted to perform resuscitation maneuvers, but waited five minutes before calling the hospital’s Code Pink team of neonatal resuscitation experts. The hospital contended that Nala’s distress was caused by a placental infection, which the physicians discovered after Nala’s birth. A placental infection such as chorioamnionitis or villitis certainly can cause distress in an infant due to the fact that these infections oftentimes cause the placenta to be deficient in providing oxygen to the baby through the umbilical cord. Physicians are supposed to carefully monitor pregnant women to ensure that any type of infection is quickly diagnosed and treated so that the effects on the baby are minimalized. In Nala’s case, however, there was evidence that someone at the hospital changed Nala’s original Apgar score to make it look better, which would then help justify the nurse’s failure to quickly call the resuscitation team. An Apgar score is a number used to quickly assess the health of a newborn immediately after birth. Nala’s attorney had a forensic expert analyze the records that contained the Apgar score, and the expert testified at trial that the score was altered. After deliberating for 15 hours, the jury ordered that the hospital the pay $8.5 million to cover the lifelong care of Nala that is necessary as a result of the medical team failing to promptly and properly resuscitate Nala, which caused her permanent brain damage. Nala’s tragic story emphasizes the critical importance of prompt and skillfull resuscitation, as well as the need to pay serious attention to devices, such as an Apgar score, that can be indicative of poor health and distress. In addition, infections in a pregnant woman must be immediately treated so that the baby doesn’t become distressed, oxygen deprived and brain damaged. When a baby’s brain does not receive sufficient oxygen, either due to lack of oxygen in her blood (hypoxia) or diminished blood flow in her brain (ischemia), brain cells may start to die and a form of brain damage called hypoxic ischemic encephalopathy (HIE) can result. Nala’s case is a reminder of just how severe the brain damage can be when a baby is deprived of oxygen, and it underscores the importance of preventing oxygen-depriving conditions. Perform chest compressions on the baby in order to increase a very slow heart rate or to get a stopped heart to start beating. Compressions help the heart disperse blood to important organs, such as the brain, to help prevent permanent injury. Appearance/complexion. Is the baby blue or pale all over, is the body pink, or is the baby blue at her extremities? Pulse rate. Is the baby’s heart rate absent, slow (<100 beats per minute (bpm), or fast (>100 bpm)? Reflex irritability. Does the baby have no response to stimulation, does she grimace and give a feeble cry, or does she cry and pull away when stimulated? Activity. Does the baby exhibit no activity, have some flexion (joint movement), or does she have flexed arms and legs that resist extension? Respiratory effort. Is the baby breathing, does she have a weak, irregular respiratory effort, or is her cry really strong? The testing typically is done at one and five minutes after birth, and it may be repeated later if the score remains low. A low score on the test may indicate that the baby needs medical attention, including resuscitation. If the score remains low at later times, such as at 10, 15 or 30 minutes after birth, there is a risk that the child will suffer long-term neurological damage, and there also is a small but significant increase of the risk of cerebral palsy. Higher Apgar scores, however, do not rule out the possibility that the baby will suffer brain damage from HIE. It is important to remember that the purpose of the Apgar score is to quickly determine whether a newborn needs immediate medical care; it was not devised to make long-term predictions regarding the baby’s health. Failure to appreciate the significance of a low Apgar score can lead to failure of the medical team to act quickly. In baby Nala’s case, the nurse waited five minutes before even calling the resuscitation team. It is imperative that proper resuscitation maneuvers be administered as soon as a baby requires them. If medical malpractice is suspected in a birth injury case, getting help from an experienced attorney is important for a number of reasons. One reason it is important is because medical records can be extremely lengthy and difficult to read; they contain formats, abbreviations and symbols that oftentimes are only understood by medical personnel. An experienced birth injury attorney is familiar with these records and knows how to find evidence of negligence, even if the evidence is simply one number. In Nala’s case, her attorney stated that the “most telling piece of evidence” was the record of Nala’s Apgar score, which had been altered. Indeed, the medical record is the basic reference document used in medical malpractice litigation. Federal and state laws dictate that medical facilities and health care providers must maintain complete and accurate medical records for each patient. Accuracy in the medical records is essential because subsequent physicians and medical personnel rely on them to get an accurate picture of the patient’s medical history and condition so that proper treatment can be provided. It is illegal to alter medical records with the intent to deceive or mislead anyone. The liability resulting from such an act may be civil, or in some cases, criminal. There are many instances in which physicians and health care providers faced with disastrous results try to hide the facts that may point to an error on their part. Key records or lab reports may mysteriously disappear from the patient’s record. Negative facts may be erased or changed, or false data may be added to the record. When physicians are caught having tampered with records, an otherwise potentially defensible medical malpractice case can become impossible to defend. When the deception is uncovered, juries are apt to award larger damages than they may have otherwise, and insurers are much more eager to settle. Any untimely, poorly maintained, incomplete, illegible or improperly altered medical record can be used to suggest that the physician provided inadequate medical care. In addition, records that appear poorly maintained or that are incomplete or improperly altered can be used show that the physician attempted to “doctor” the treatment record to conceal a fact or facts that are evidence of negligence. Doctored records can be uncovered in a number of ways. Sometimes, the alteration is obvious, and when the physician is deposed, her explanation for the change is implausible. If the alteration was handwritten, a document examiner/forensic expert may be able to show that the notations were made at different times, by analysis of the ink used, the handwriting itself, or some other technique. Sometimes two versions of the same record are uncovered, which is devastating to the defense. In most states, a judge will instruct jurors that they may infer–from deceptive alterations of medical records–a belief on the part of the physician that she had committed a medical error. A skilled attorney understands that there is the possibility of document alteration in every medical malpractice case, and an experienced attorney knows how to find altered or missing records. When discovered, alteration greatly increases the value of any recovery. When delivery complications arise, it is the responsibility of the medical team to act quickly and appropriately to minimize the risks to the mother and baby. An experienced birth injury attorney can pinpoint incidents of negligence. 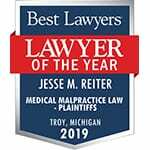 At Reiter & Walsh ABC Law Centers, Jesse Reiter is dedicated exclusively to birth injury cases, and he has decades of experience in this field. He has helped numerous families whose children have HIE, and he has discovered altered medical records in many of his birth injury cases. In addition, he has worked with experts from around the country, including forensic experts. If the physician or medical team fail to properly monitor a baby or act skillfully and quickly when complications occur, it is negligence. If a hospital is ill-prepared to perform resuscitation procedures or the medical team improperly performs the procedures, it also is negligence. If this negligence results in injury to the baby, it is medical malpractice. At Reiter & Walsh ABC Law Centers, our attorneys will research your case, find the cause of injury and determine if negligence occurred. For decades, we have been helping families in Michigan and throughout the nation, and we have numerous multi-million dollar verdicts that attest to our success. We will fight to obtain the compensation you and your family deserve for lifelong care, treatment and therapy of your child, and you never pay any money until we win your case. Call us at 888-419-2229.